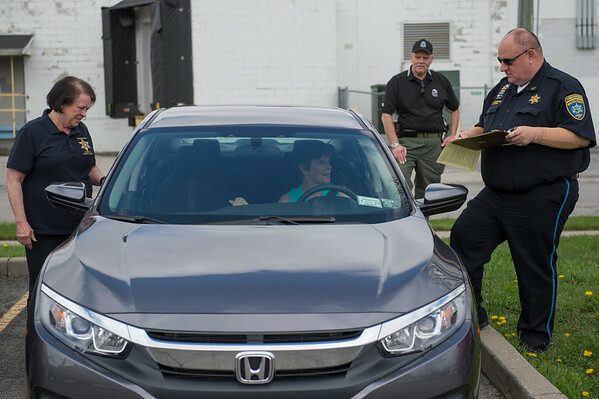 JOED VIERA/STAFF PHOTOGRAPHER-Lockport, NY- Niagara County traffic of safety office educator Grace Destino, Town of Niagara police officer Mike Rozyczko and Niagara County Sheriffs dispatcher Roger Yurek look over Angie Blackley's vehicle. during the CarFit event at the Dale Association on Wednesday afternoon. Yurek said that drivers are afraid that CarFit technicians are out to take their licenses "Thats not what we do" he said. CarFit techs inspect older drivers' vehicles to ensure they are properly adjusted for safety.